Smart Wifi technology allows you to control thermostat settings from anywhere via phone, tablet or computer. Fully flexible programming options that adjust temperatures to fit your daily life. Intelligent alerts including, filter change reminder, humidifier pad change reminder, Hi/Lo temperature notification and loss of internet connection. Customizable user-friendly touchscreen that is in full color, bright and easy to read. Locking touch screen with password protection. Up to date weather reporting lets you view local weather and 5-day forecasts. Features a reliable and secure network that ensures you always have access to your thermostat. Automatically determines if your home needs heating or cooling to provide maximum comfort. Humidity readout allows you to view indoor and outdoor relative humidity levels. Permanent/Temporary/Vacation hold settings allow you to adjust temperature to suit your schedule. Gives control of the fan operation including On/Auto/Circulate Settings. Display options include: screen-saver on/off, English/Spanish/French language interface, C or F temperature display, 12 or 24 hour clock. 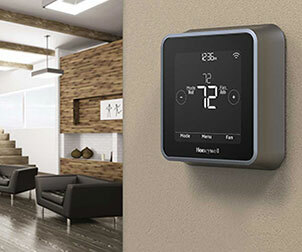 Honeywell smart Wi-Fi thermostats allow you to adjust and control your thermostat from virtually anywhere. On screen display options allow you to create your own unique look to match your home or business decor. Enjoy unsurpassed comfort control and receive reminders to change a filter or be alerted of extreme home temperatures to ensure your home or business is always at your desired temp. 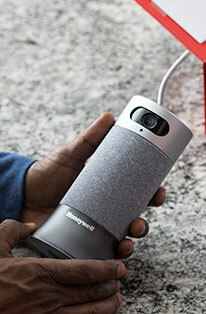 Honeywell Wi-Fi thermostats can be controlled via smartphones, like the iPhone and Android, tablets and a computer. This thermostat offers fully flexible programming options including a program based on your home or small business schedule and a program based on your utility company's peak rate pricing. Other features include intelligent alerts, filter change reminders, weather forecasting, humidity readout, auto climate control and multiple display options. 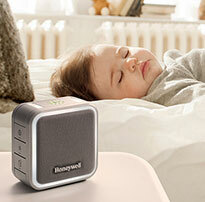 Bring total comfort control right to your fingertips with the Honeywell RET97A Wi-Fi thermostat. C wire is required and is the power source. Without a C wire, The Honeywell Wi-Fi Smart Thermostat with Color Display will not power up. Dimensions: WxHxD (in.) = 4.5 x 3.5 x 0.9. I love to be able to control it anywhere in am. Affordable, easy to use, nice display, remotely accessible. What else could you ask for! Thermostat was easy to install and worked properly on first fire-up. There was plenty of instructional material and everything went together quite nicely. Buy this product. It will decrease your energy bill. The convenience of being able to set the thermostat from anywhere is great. Works like a champ. 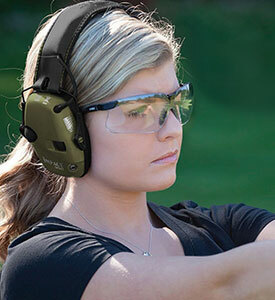 I'm going to buy one for my camp in the mountains. This Wi-Fi Thermostat is one of my favorite purchases for my home. I can set it to cool or warm the house from work so it will be perfect temp when I walk in the door. I also love it when traveling as I can monitor the temps and humidity in the house with unpredictable weather and adjust as needed to protect my pets when the pet sitter is not there. As a Designer, I love that you can customize the screen colors by your decor or by season. I ABSOLUTELY LOVE LOVE LOVE THIS THERMOSTAT!! I can change the temp from my bedroom, or outside of the house while I am away! I wish I had purchased it sooner! Love the different colors too! Installed two of these in my home. Theyre wonderful and very easy to program. I love the weather forecasting tool and the ability to control remotely through the application. Background color and the high-tech look is a big plus. Would buy again. This is a great Thermostat and also very easy to install. Since I stated using it I have already seen a difference in my heating bill. Its very easy to Program and also looks good on your wall.